Food in Wales means many things. For some it is sheep on the mountains, shellfish in Cardigan Bay and black and white cows in the ‘milk fields’ of the southwest and the northeast. For others, it is free school breakfasts, a childhood obesity rate that is the highest in the UK with over 28% overweight or obese in the most deprived areas, and a population that doesn’t eat enough fruit and vegetables. Then again, it is an industry with an annual turnover of nearly £17 billion that employs a quarter of a million people, a money-earner that can never be outsourced. Or it is the growing number of food banks – 157 last year – which co-exists with the 300,000 tonnes of food waste thrown out by Welsh households in 2015, below average for the UK. It is prestigious food festivals and high-end restaurants, and it is parents who don’t know how to cook a meal from scratch and children who have never seen a cow. It is back gardens, allotments and community gardens where many of us grow at least a few veg, and it is Welsh cakes and cawl, the remnants of our peasant food culture. And it is our connection with the natural world: the winter stubble and hedgerows that shelter nesting birds, the bees that pollinate our orchards, the grassland that puts carbon in the soil and keeps the climate cool. When food is so much part of our lives, and has so many apparently unrelated aspects, how do we join the dots and make it work on all fronts – health, the economy, the environment, social justice, farming, climate and culture? It is an absolute necessity for our survival that we all work together on this, but so often the pressures of rapid change set one interest group against the other and the system fragments. Economic expansion may have an unacceptable environmental cost, affordable food means low pay for those who produce it, nutritionists don’t talk to farmers (much) and food education struggles for a place in an overcrowded school curriculum. And it’s not just at the policy level that we are divided. As a society, we are increasingly isolated from each other, as the technologies that are supposed to connect us actually draw us apart: the car that means we can live far away from our jobs and families, the internet that gives us enough company not to bother with our neighbours down the road, the smartphones around the dinner table – and in many homes, no dinner table at all. Loneliness is epidemic, and in a culture where the economy is all-important, those who are not in good jobs – the young, the old, the underpaid, the sick, their carers – get left behind. What’s needed is a national conversation, ideally over a meal, that emblem of togetherness. We need to step out of our professional and economic roles for a while and connect as human beings. We also need to move beyond the comfort of our own kind and seek out those who see things differently, not just because there are joyful discoveries to be made, but also because sometimes the very discomfort of such encounters wakes us up to new possibilities. That is the buzz that happens when a farmer goes into a school classroom, for instance, or a supermarket manager delivers surplus food to a Christmas dinner for homeless people, or a primary school teacher learns some gardening from a grandparent. Rather than seeing the complexity and rival agendas of the food system as a problem, we could see them as a sign of unrealized potential. What new connections could we make? And what fresh enthusiasm might be released if we thought we could really make a difference and that it was worth trying? The more intractable a problem may appear, the greater the benefits that might result. Now is the time for creative thinking, for imagination, for play. Feeding the world is a job for the arts as much as the sciences. This is the premise of a proposed new Food Network Wales. So far it is simply an idea and an invitation, linked to a Food Manifesto Wales that has been ticking over for a few years, gathering blog posts and followers. It aims to be a space where conversations can happen and new ideas emerge, as well as a conventional network that will make some new connections in the food system. It has only just begun and will only grow if it meets a need and attracts support; it is an act of faith. It does however have strong underpinning values, and it builds on some encouraging developments in Wales and beyond. One of these is human rights, including the right to food enshrined in international law and placing obligations on government and business. Another is the Well-being of Future Generations Act (Wales) 2015 which requires public bodies to work with business and civil society on matters which affect the general population, and to extend this concern to generations yet to come. Our commitment is therefore to a food system which is fair, provides good food to all, enriches our lives, supports human connection and coexists with a thriving natural world. Just as importantly, when compromises inevitably have to be made, these should be on the basis of respect and dialogue. Sensitive issues should not be settled by a contest to see who can shout the loudest or buy the most advertising space. Running alongside this, we need a step change in the way we think of ourselves, leaving behind the passive role of the consumer and the employee and claiming our agency as citizens, as the New Citizenship Project’s Food Citizenship report argues. It is not enough to excuse ourselves on the grounds of the power wielded by governments or multinational corporations, or the limitations of our job remits, or the unfairness of the ‘system’. We can all do something, however small, and that counts. Citizens are to be found everywhere: in government, in community groups, in business. It is time we identified ourselves as such. Could you be part of the new Network? Read more about it and complete our survey. This month, Wales sees the Well-being of Future Generations Act pass into law. That means that public bodies in Wales will be required to explain what they are doing to safeguard the wellbeing of people not yet born, and how they plan to make the world a better place for everyone. The Act does not just describe the sort of Wales we want to see – thriving, prosperous, healthy and living within environmental limits, with strong communities, social justice and a bilingual culture – the principles that have inspired the Welsh Food Manifesto. It also provides guidance on how we get there, specifying five new ways of working for public bodies (and, let’s hope, everyone else) to follow. These are: to think long-term, to focus on prevention rather than cure, to integrate different activities and be consistent, to involve everyone in the decision that will affect them, and to collaborate with others. Collaboration was one of the main topics of discussion at the Delivering for Future Generations conference on 16 March at which Sophie Howe, the recently appointed Future Generations Commissioner, took up the baton from Peter Davies who had led the process of developing the new Act and the ‘Wales We Want’ conversation which informed it. The big question was: How can businesses, the public sector and the third sector – that is, charities, the voluntary sector, campaigning groups, and the public generally – work together effectively to give us the Wales we want? Sophie Howe was quick to celebrate the third sector, which with its inventiveness and freedom of movement can do things that government can’t, citing the example of Actif Woods Wales, who have been working with Aberystwyth MIND to take people with mental health problems out into the woods where they find a space for healing through nature, crafts and companionship. Examples like this abound, supported by a combination of public sector funding, civil society volunteering and business sponsorship. Speaking from the public sector, Paul Matthews of Monmouthshire County Council was inspiring on the need for public servants to show leadership by moving out of their comfort zones and risking failure. The challenge of the future was not a technical one so much as a test of adaptive leadership, he said, and this was what public servants most deeply wished to offer. Businesses meanwhile, with their capacity to innovate and drive change, are encouraged to engage with the Sustainable Development Charter, where they can be acknowledged for the steps they take to improve their practices and learn from each other. As Peter Davies said, we need a business sector that supports the environment and social justice, so this is a crucial area. So how is all this going to pan out? There were many positive examples of collaboration at the conference, but there are also all sorts of reasons why the three sectors, and the many subsectors within them, don’t always get on. Our Food Values project last year revealed some of the differences as they play out in the food system: businesses may be driven by a profit motive that sees food as a commodity, while community groups see it more as a social connector, and lament the lack of food skills in the younger generations. Government is torn between apparently competing objectives of health, economy and social justice. NGOs compete for funding with their niche approaches – should we be spending public money on food festivals, or teaching children to garden, or health education, or food poverty, or protecting wildlife? Some groups are even in outright opposition to each other. There is not much common ground between the pro-GM and anti-GM lobbies, and there are plenty of polarized debates about farming versus wildlife, globalization versus local food, and livestock rearing versus reduced meat diets, to name just a few tricky areas. Everyone has plenty of reasons why it’s going to be difficult to change the way they work. That isn’t a reason to draw back, though. Just as the boundary between two cultures can produce a rich diversity with possibilities all of its own, as Wales demonstrates, so the faultlines between and within business, civil society and government are where different value systems rub up against each other and change happens. All three sectors are simply ideas to which all of us subscribe to a greater or lesser extent, and it is our humanity that counts in the end. Are we up to it? At the Welsh Government’s recent Food for the Future conference in Llandudno, the corporate sector was well represented, and rightly so, given the proportion of our food that reaches our plates via the superhighway that is the global food industry. So also was the health sector, there to express concerns about rocketing rates of obesity, diabetes and heart attacks. There was much talk therefore of the relationship between the food industry and the public, and I was struck by a remark made by Tim Rycroft of the Food and Drink Federation, the industry body which represents the UK food and drink sector, with members all the way from Tregroes Waffles to Tate and Lyle. 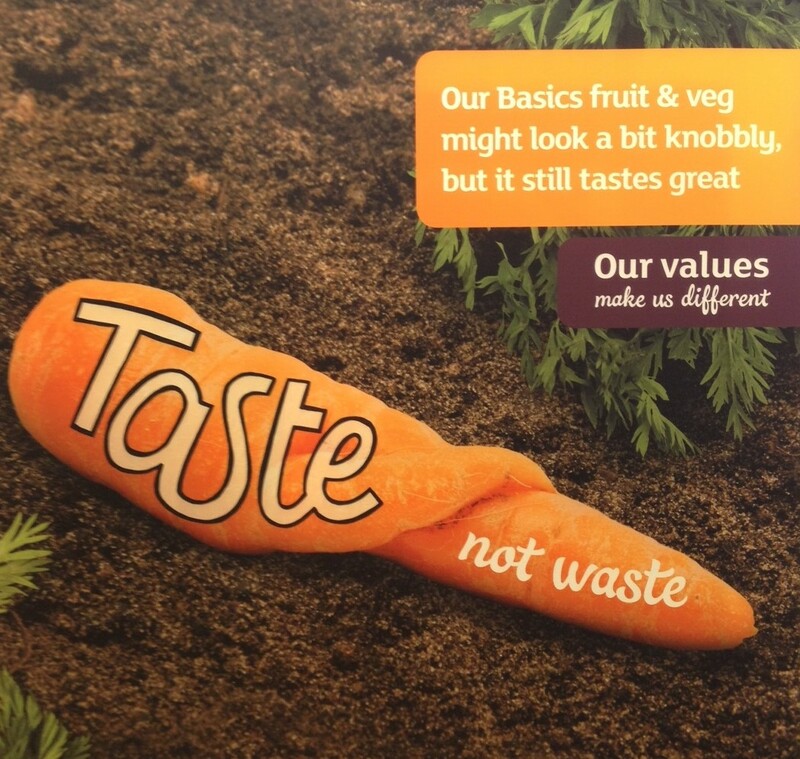 ‘Our values make us different’ – but how different? Food, he said, is part of the cultural fabric of our society, and this is particularly true in Wales, where people have a particularly soft spot for food produced in the part of the world they call home. That is certainly true. It’s what connects us as families and communities: just think of Sunday lunch, picnics at the beach, allotments, cafes and the workplace canteen. And the opposite of that: TV dinners, children who don’t know where milk comes from, adults who can’t boil an egg, junk food and worst of all, no food at all. Food connects us and expresses who we are as a society, and it links us to the natural world too. So what is the supermarkets’ response to that? Both Tim Rycroft and Nick Canning of the supermarket chain Iceland had much to say about the quality and freshness of their food, the information that they give their customers about what’s in it, and the steps that the industry is taking to move away from special offers that steer us towards buying more than we need, or making unhealthy choices. They are taking confectionery away from the tills, reducing salt content, producing low-fat ready meals and labelling their products to tell us what’s in them. Many of them are also (though they didn’t say this, because the focusof the conference was on the health of the Welsh population above all) sourcing some of their produce ethically through various certification schemes such as Fairtrade, Freedom Foods and organic. All this is good, and there is no doubt that corporate food is aware of its social responsibilities and taking some steps in the right direction. Still, I felt there was something missing, and I think the problem lay in the rhetoric of ‘the consumer’, and the uneasy relationship between the profit motive and the aim of feeding a healthy population. When the consumer – and in the mass, a local community – is the source of a supermarket’s profits, how much more lucrative to sell them what they want, rather than what’s good for them. In the strange world of the supermarket, where the lights are bright and the choice is vast, it’s easy to do that. Those flapjacks might be clearly labelled as being 30% sugar and 20% fat, but who cares, when they look so alluring? I think if the food industry is really to serve the society of which it is part, it needs to engage with its ‘cultural fabric’ in a more genuine way, building it up rather than mining it. We all need to stand up as citizens, not producers and consumers, and see how supermarkets can be more a part of their local communities, rather than outposts of their head offices. There are plenty of examples of good practice already: supermarkets have been sponsoring school gardens, donating surplus food to charity, linking schools with farms, promoting local produce, funding community groups to grow food in their carparks, and hosting farmers markets. What if instead of doing these things in a piecemeal way, with an eye to PR, supermarkets really committed to the job of rebuilding local food networks, and thereby strengthening local communities, and we held them to it? Let’s stop talking about us and them, and join together to transform our food system into one that really embodies our values of care, fairness and balance with nature, not just for ourselves now, but for future generations. Outside the library in Machynlleth is a set of raised beds with herbs and salads growing in them, plus hazel arches which in summer bear beans and squashes. In the carpark of the nearby Coop supermarket, there are redcurrant bushes, rhubarb and more herbs. Round the back of the Plas, there are picnic tables with apple trees growing up through holes in the middle and troughs planted up with thyme and rosemary. This is all thanks to a project called Edible Mach, which engages teams of volunteers to maintain eleven plots around the town, growing food for the public to pick and adding an unexpected twist to public spaces – flowerbeds with a difference. It’s inspired by the original Incredible Edible project in Todmorden, the Yorkshire town celebrated for its dedication to public vegetable growing, where the police station is famous for the sweetcorn in its front yard and the concept of ‘vegetable tourism’ was born. 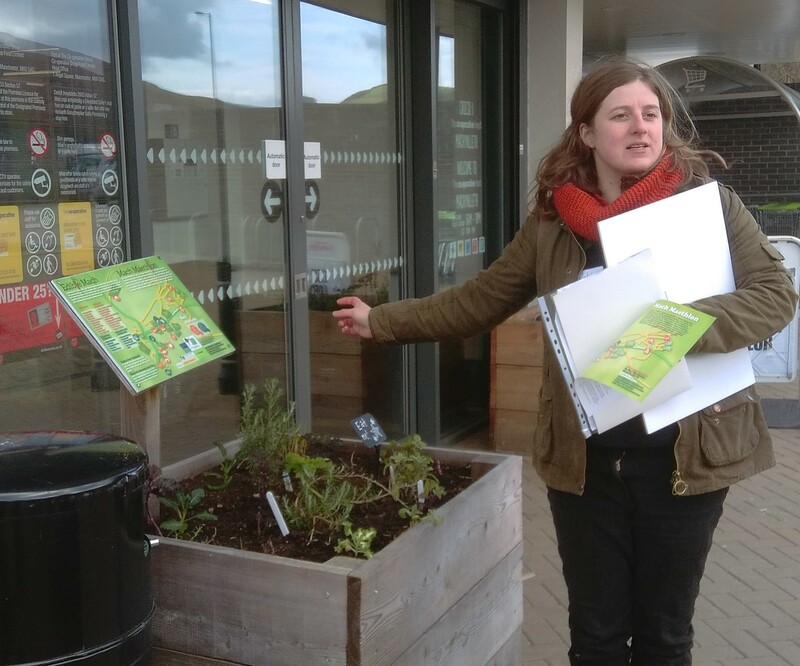 We were there for a course on how to ‘Fill the streets with food’, which included a guided tour of the Machynlleth project and tips on how to get started. Growing vegetables in public spaces is sometimes known as ‘guerrilla gardening’ but it’s better done with the full consent of the local authorities, who see much to gain from the unlikely vegetable beds: less litter, more neighbourliness, local colour. Councils are often willing to make land available, and local businesses to sponsor materials and plants. Volunteers are of course vital to the enterprise, and in turn gain from the social interaction and sense of contribution, while paid staff are invaluable in holding a project together and looking for new opportunities. People had come from all over mid Wales to find out more, and there were enthusiastic discussions about what we could do in our home towns: a raised bed here, an apple tree there. The big question though seemed to be: where do the volunteers come from and what keeps them going? Who are these people who are happy to give up their free time to grow food that for the most part they won’t even get to eat? Will the initial enthusiasm last? This led on to a discussion about selfish and compassionate values, and tied in nicely with research from the Common Cause Foundation which says in essence that people are more altruistic than they are given credit for. Most of us have a strong allegiance to values such as kindness and justice, and really want other people to be happy, even if we are fickle and easily panicked into looking after Number One. However, we tend to think that it’s just us that wants to contribute to a better world, and that everyone else is driven by the profit motive. We always put money into honesty boxes, but we are pretty sure most other people don’t. And so we go along with the general assumption that other people are selfish and have to be bribed and coerced into doing the right thing, and because that is a soul-destroying way to relate to each other, we give up. Interestingly that gap between holding compassionate values ourselves, but thinking that other people don’t, is particularly marked in Wales and leads to a general pessimism about our neighbours which holds us back from positive action. If we only realized how much other people care, we might not feel so much embarrassment about asking them to contribute to community projects, and we might create a positive spiral of good actions, building higher and higher levels of trust and cohesion. Growing vegetables in public spaces is powerful because it makes altruism visible, in exactly the same way that giant advertising hoardings promote the profit motive. Visitors to the library at Machynlleth see that their fellow citizens have gone to the trouble of creating a pleasant experience for them, providing both beauty and food, and that challenges their assumptions about selfishness. It creates trust and shows that people are valued as humans and citizens for once, not for their spending power and their achievements. It reminds us that we are all equal in our need to eat, and that providing food for each other is one of the most basic human obligations. And that is maybe why people want to help keep the vegetable beds attractive and productive. Writing in the introduction to Feeding Britain, the all-party report on food poverty published in 2014, the Bishop of Truro made a plea for a discussion about values. As he put it, “We believe it is time to look again at the state of our country and to review the fundamental values that led to the creation of our welfare state.” He went on to describe how we have lost the glue that holds society together, that is, the informal networks of families, neighbours, community groups and so on that people can turn to in a crisis, and how we need to put it back. Food poverty is often framed as the problem of certain unfortunate individuals, an attitude betrayed by suggestions that if only they knew how to cook from basics, they could afford to eat on a tiny budget. The Feeding Britain report suggests however that food poverty is inevitable in an economy where the minimum wage does not allow people to live with dignity and it calls for radical moves to put the situation right. At a recent conference on food poverty in Cardiff, the lesson that emerged for me is that our entire society suffers a disconnect from food, buying much of it in prepared form, processed with sugar and salt, and never having set foot on a farm or grown so much as mustard and cress. No wonder that obesity, heart disease, tooth decay and all the rest are affecting our quality of life, while our farmers are at the mercy of the commodity markets and public subsidy. Our Food Values project, which has been running for six months now, has been looking at some of the underlying values that determine people’s attitudes to food. We’ve supported food events with local partners in Cardiff, Newtown, rural Gwynedd and Aberystwyth (twice) and talked to people about food. What does it mean to them? How important is local food? What’s their favourite recipe? Do they grow food themselves? How do they decide what to buy? And what is organic food all about? As we expected, food is very close to people’s hearts, and everyone has a view on it or a story to tell. It connects us to each other and to the local area, it is associated with cooking and growing skills passed down through the generations, it is precious and should not be wasted, we want the people who produce it to be fairly rewarded. These conversations brought out, through food, some of the fundamental values that we live by: those of meeting our own basic needs for security and health, looking after ourselves, caring for others, creating pleasure, finding our own way in life, caring for nature, and creating a just and peaceful world. Which brings us back to the Bishop’s plea that we look to our values, and begin a much larger and deeper conversation about how we live together. The organic movement has a vital contribution to make here. Based as it is on principles of health, ecology, fairness and care, it has always been aware of the social context of food, and promoted a vision of a healthy soil supporting a healthy human population. In this view of things, food is not so much a commodity as a human right. Our project has shown some of the power of food to connect people and to start a conversation about the food system and the society we want. We will present the results at our closing conference on 3 June in Cardiff, where we will explore how a shift in values might improve food security and sustainability for the people of Wales, and also how food itself might be the means of building a more just and sustainable food system in balance with nature. We have also produced a set of publications which are available here.